Raw sweet potato is a really awesome replacement for wheat toast. It’s crunchy, slightly sweet and easy to prep. Plus did you know that raw sweet potatoes are edible? Yes! I wouldn’t eat a whole lot of it though as it’s pretty starchy but eating a few slices is ok.
Run the peeled sweet potato over a mandolin and cut it into thin long slices. Blend up beet, apples and sesame seeds until creamy and fill it into a bowl. Add the blue spirulina powder into the coconut yogurt and stir it up. 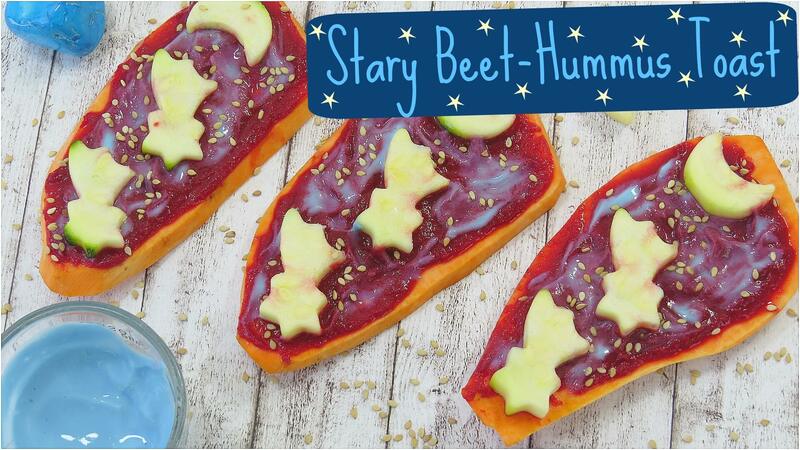 Spread some of the beet hummus onto a sweet potato slice, drizzle it with the blue coconut yogurt and decorate it with the stars and sesame seeds. Enjoy your crunchy sweet treat!